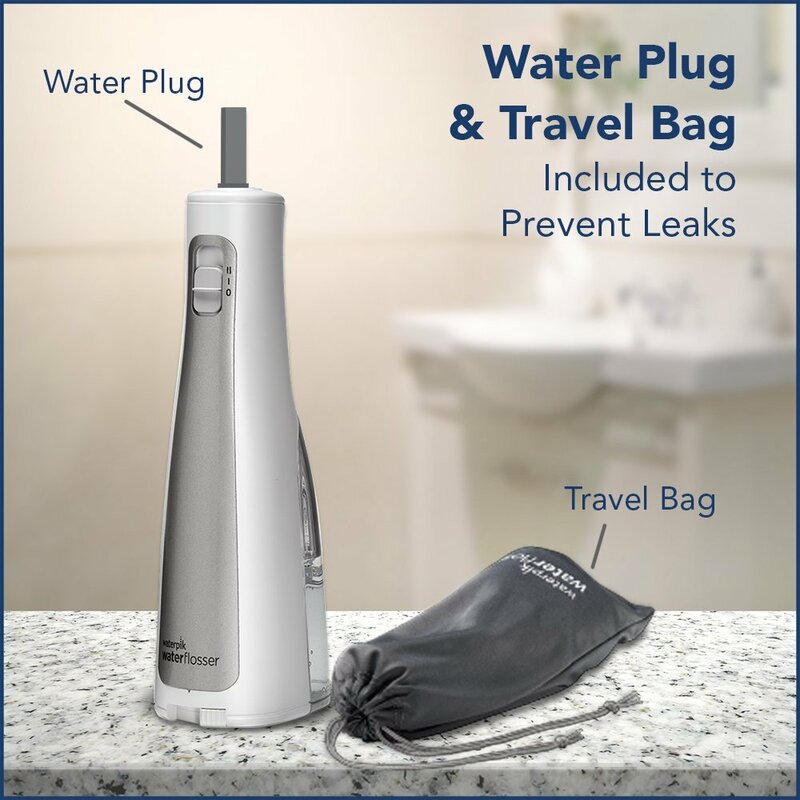 Waterpik has many cordless products, all of which were designed for to be taken with you when you are traveling. 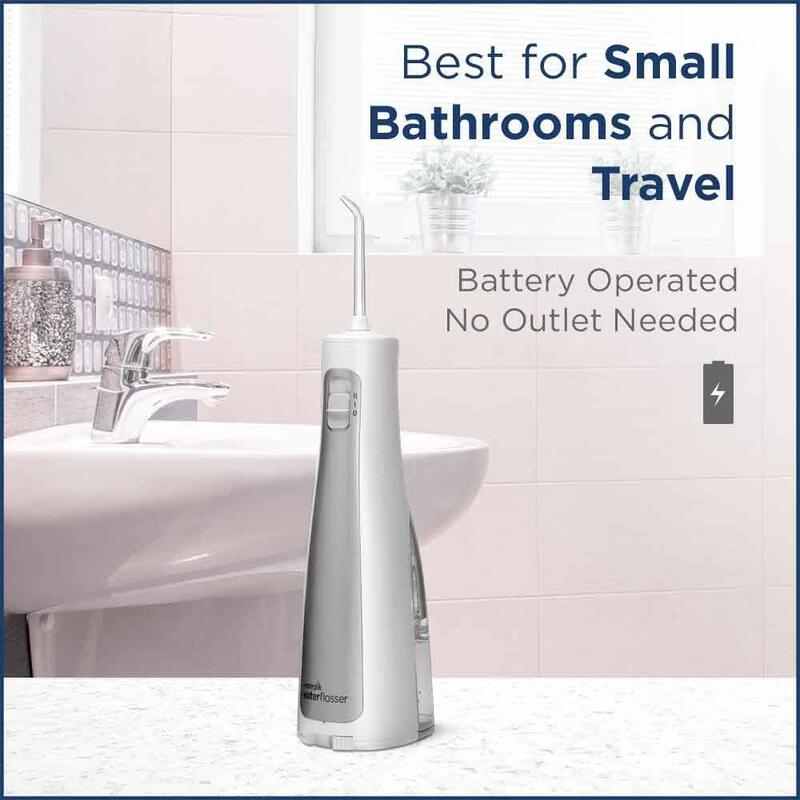 However, out of all of them, I feel like the Waterpik Cordless Freedom truly deserves to be known as the portable water flosser because it runs on AA batteries. All other models have built-in batteries which can only be charged on 120V, meaning you can’t charge it using foreign power outlets unless you have an adapter. Upon opening a brand new box, here is what you’ll find inside. Located at the front of the unit is the power switch. There are 3 settings, each one does something different. O – Turns the device off. I – On/Sets the device on low pressure mode. II – On/Sets the device on high pressure mode. If you’ve used other Waterpik cordless flossers before, then this should be familiar. Cordless models only have 2 pressure settings, low and high, which are equivalent to 45 PSI and 75 PSI respectively. Comparing this to countertop models which have 10 pressure settings, this is approximately equivalent to a 4 and 7. Unfortunately, the same issues I had with the power switch is prevalent here as the other models like the Cordless Plus, which is that it feels loose and unresponsive. I always unintentionally slide the switch past the low pressure setting all the way to the high pressure setting because of how slack the switch is. This isn’t an issue if you only use high pressure before turning it off, but it is something to take note of anyways. At the bottom of the Cordless Freedom you will notice a small grey switch. This is the switch that locks/unlocks the battery cover. There are icons to indicate which direction locks/unlocks the cover. Once you’ve unlocked it, you can remove the cap and insert or change out the AA batteries. The Waterpik Cordless Freedom needs 3 AA batteries to work. You can use rechargeable NiMH batteries to save on battery costs in the long run. The Cordless Freedom comes with 3 batteries to get you started, however you should have another set on hand since these won’t last as long as name brand batteries. On the back we have the water tank, capable of holding up to 5oz (150ml) of water. For some reason, Waterpik decided not to put measurements anywhere on the tank or unit, which is something all other cordless Waterpik models have. If you need to administer medication to your teeth or gumline, you will have to do some extra work by measuring it separately before putting it into the water tank to be diluted with water. On the side of the water tank you’ll find the flap that covers the hole that you’re supposed to fill with water. Though it looks flimsy, we have rigorously tested it by shaking it to see if it would leak or accidentally open up, and were pleased to find that neither occurred. Filling the water tank might be a bit of a problem for those with smaller sinks, since normally it is attached to the unit and this extra bulk could be cumbersome. Fortunately, you can detach the water tank from the main body so it is easier to fill up in the sink. This also makes it easier to clean which you should do frequently. Since the water is getting pumped directly into your mouth, hygiene is a big concern. You can choose to wash the water tank by hand, or you could put it into the dishwasher (only the tank itself, not the main unit or any of the tips). Located at the top of the unit is a hole where you can insert a flosser tip. Just press the tip down until you hear a satisfying click, indicating that it is secured. The grey button located just above releases the locking mechanism so that you can freely swap out the tips if you share the unit with someone else. 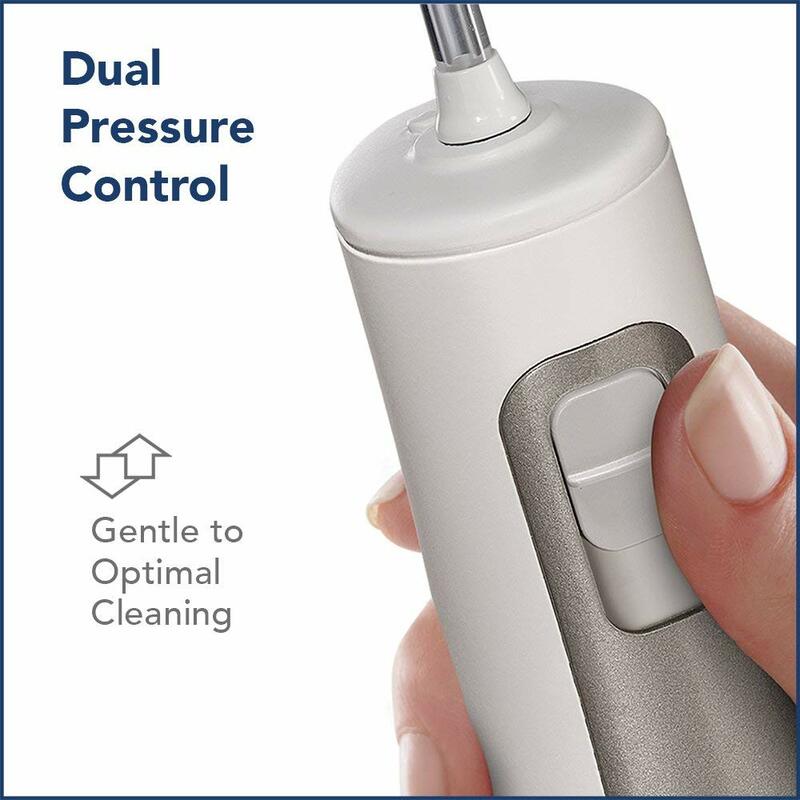 Unlike Waterpik’s other cordless flossers, the tip cannot be rotated, meaning the tip will stay facing the direction you put it in. If you are in the middle of flossing and find yourself unsatisfied with the angle of your flosser tip, you will have to eject the tip and reposition it to a new angle. Obviously this is cumbersome to do and it is disappointing to see that you cannot rotate the flosser tip on the fly. Included with the Cordless Freedom are three flosser tips. Two of them are the classic jet tips, which are included with all Waterpik flossers, and it is effective for general flossing purposes. The Plaque Seeker tip is special because of its three thin tufts of bristles that give you some extra scrubbing power for cleaning dental work such as bridges, crowns, and implants. Lastly, there is an included travel plug which helps prevent grime and dust from accumulating and to prevent residual water from leaking out into your luggage. 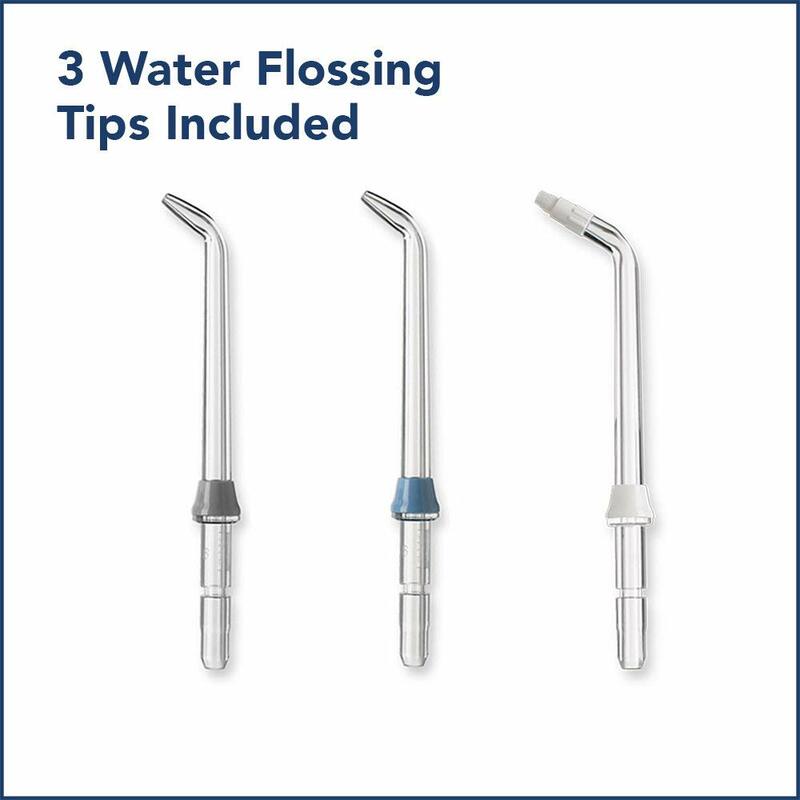 This barely scratches the surface for the vast amount of flosser tips that Waterpik offers. If you want some more detailed information regarding what’s available, be sure to read our review of all the Waterpik flosser tips. Even if a product has small enough of a form factor to be portable, that does not necessarily mean it is travel-friendly. Oftentimes you need to prepare some extra bags to store all the pieces like the flosser tips, the water tank, and the main unit itself. Staying true to its name, the Cordless Freedom comes with its own carry bag which simplifies this part of the process, and gives you the freedom to easily take your flosser with you wherever you go. What makes this bag better than other bags? For starters, it is made from a soft micro-fibre material which is water-resistant. The drawstring tightly seals the bag so you can be sure the flosser will not fall out. Technically there is enough room for you to store your flosser tips as well, however they can bounce and shift around frequently. If you are afraid of them breaking, or if you want the most hygienic option, put them separately in an air-tight container, such as a Ziploc bag. In terms of protection, the bag will protect the flosser from suffering small scratches and scuff marks, but that’s about as far as the protection goes. If you accidentally drop the bag onto hard floor, then it will sustain serious damage. Finally, let’s take this baby out for a spin. 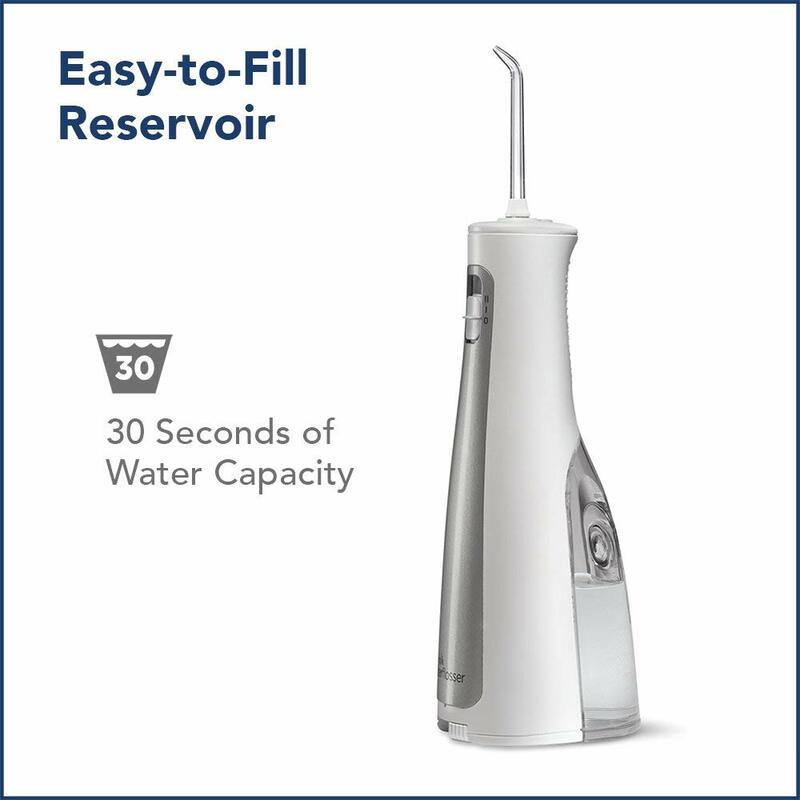 Like all cordless models, there is an inherent flaw in that the water tank adds a lot of bulk and weight to the product, making it cumbersome to hold compared to the thin handle of a countertop flosser. You will not be able to maneuver a portable model as smoothly as you would the handle of a countertop flosser. If you were expecting a comparable level of maneuverability, sorry to disappoint. Other than some protruding bumps located on the back of the flosser, which provide a small amount of grip on an otherwise smooth surface, you will not find much else to keep the device secured firmly in your hands. 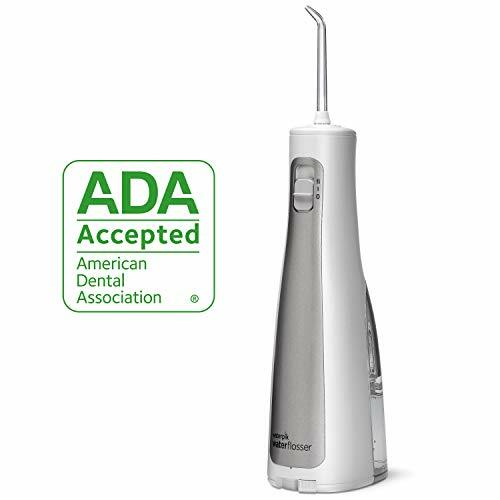 This is a far cry from Waterpik’s Cordless Professional, which featured an ergonomic, curved neck and rubber grip handles which prevented it from slipping and it felt comfortable to hold while flossing. Filling the water was a simple affair once we removed the water tank from the main body to save space in the sink. One thing that baffled us is the absence of a measuring line so that we could find the right water level much easier. It doesn’t matter as much if you just want a full tank, but if you need to mix medications and exact measurements are required, then that’s when things get annoying. One issue that all water flossers have, portable or not, is how loud they are when you use it in the dead of night. They are extremely loud, and the Waterpik Cordless Freedom is no exception. If there is anyone sleeping in the room nearby, you will most likely wake them up. When buying a cordless product, you should understand that there are some trade-offs that allow it to be portable. We already talked about the form factor, specifically how bulky it is when you hold it. Another issue is the motor and you should understand it is not as powerful as a countertop flosser’s motor. With that said, the Cordless Freedom’s motor can achieve a respectable pressure output and should be suitable for the majority of people. Since the water tank can only hold 150ml of water, don’t expect to floss for very long (think 20-30 seconds). In the beginning, we had to refill the tank multiple times in order to fully clean our teeth. However, we used it more and began to develop our own techniques and flossing styles which allowed us to clean our teeth fully in just one tank. As the batteries begin to run out, you will notice a significant loss in performance to the point where the water pressure becomes insufficient to properly clean your teeth. We recommend you keep some spare batteries nearby after you’ve used it for a few days. 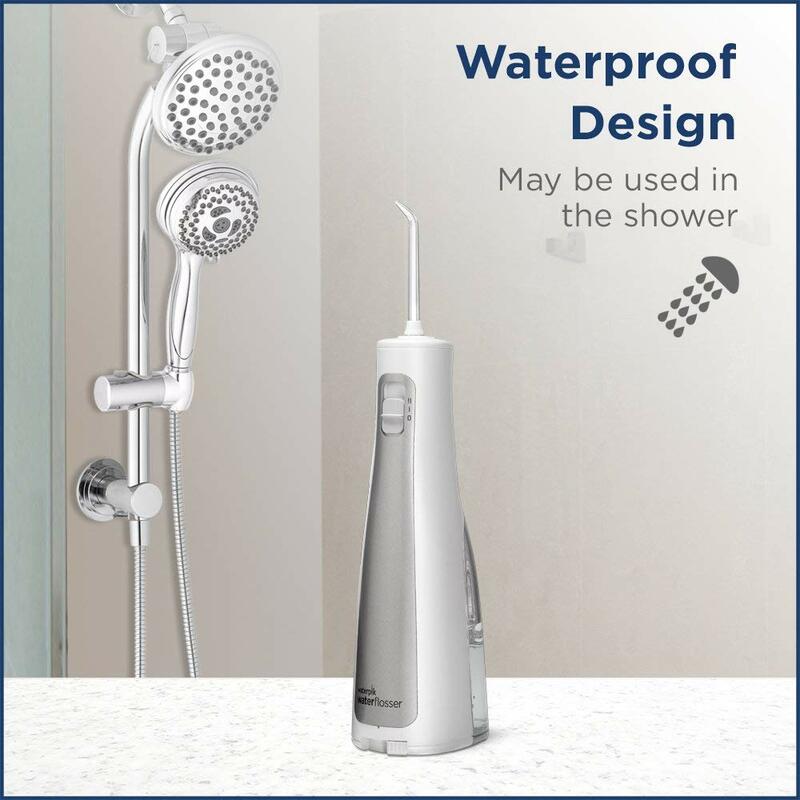 Waterpik’s Cordless Freedom is a decent product, however we hesitate to recommend this because for just a few dollars more, you can purchase Waterpik’s Cordless Professional water flosser which comes with a larger water reservoir and has a built-in rechargeable battery. The Cordless Freedom fails to excel in any area. There are some minor gripes we have such as the unresponsive pressure switch or a tip holder that you cannot adjust. They are not deal breakers, but why couldn’t Waterpik just fix these before shipping out the product? Every time we used it we had to deal with these minor annoyances and over time it can make one dissatisfied. Depending on how you view it, having the Waterpik Cordless Freedom run on AA batteries can be a blessing or a curse. It’s great if you travel internationally, and the power outlets are not compatible with your electronic devices. Having AA batteries skips this issue completely, but introduces a new one which is that you have to remember to replace the batteries every few days or else you won’t be able to floss effectively with a battery-depleted motor. If you see yourself travelling overseas frequently and want a portable flosser that can use Waterpik’s full suite of special flosser tips, then this is your best choice.